Welcome back, friends, Layle here with you for Day 4 of our Winter 2014 Reveal week! We've had a fantastic week so far with DIY™ - Design It Yourself, many new SN@P! products and our 4 new Simple Sets,. Can you believe we still have 3 more days of brand spankin' new Simple Stories goodness to share?! Let me introduce you to Homespun! Document your family memories with Homespun by Simple Stories. Burlap, gingham and flirty florals combined with stitched & embroidered accents make this collection a new family favorite. There’s no place like home when you’re creating with Homespun! Insta-Squares are a new product for us. If you've been following along with us all week, you may remember Tuesday when I introduced our new 6x8 Insta Pocket Pages with 2x2, 3x3 & 4x4 pockets. 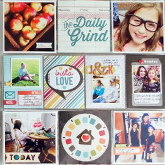 Well, these new Insta-Squares, in 2x2, 3x3, & 4x4 sizes are designed to work with those new Insta Pocket Pages! How about those Recipe Pages & Recipe cards? The Recipe Pages are designed to fit the SN@P! Binders - perfect for creating your own recipe book! Even better - the Recipe Pages are coated for stain resistance, perfect for a recipe book, especially when you're a MESSY cook like me! Now that you've seen all of the beautiful Homespun products, how about a few Homespun projects to whet your appetite before Homespun starts shipping next month? In case you were thinking Homespun won't work with masculine subjects, no siree! Kelly Goree created this fabulous layout with photos of her husband, their three sons and their dog! How about a couple of fun Homespun cards? DIY begins shipping to retailers mid February, so it won't be long before you can get your hot little hands on it! How about a chance to win a Homespun prize pack before you can buy it?!! You have 2 chances to win! Second - PIN TO WIN! Just pin your favorite of the Simple Sets images in this post, tag your pin with simplestories and homespun, then leave us a comment on this blog post telling us that we've been pinned and include your Pinterest user name. That's 2 chances to win a Homespun goodie box before you can buy it! And because I'm feeling extra generous, how about a 3rd chance?! If you're not a Simple Stories follower on Instagram, now might be a good time to start, I'm just sayin'! I'll be doing random giveaways on Instagram as well throughout the week, so follow us at simplestories_ for a 3rd chance to win! And remember, today is only Day 4 of SIX, there's still 2 more days of fabulous new Simple Stories products, so meet me back here tomorrow morning for Day 5! OMYGOSH!!! I love love love this collection!! I need it!!!!!! What a sweet collection. Love how it's all about family! WOW. The primary colors knock it out of the park for me! Great collection!! Such a pretty collection. Love it!!! How do you guys keep getting better and better? Love it all as usual!! Thanks for keeping Scrapbooking paper so cool!! Absolutely gorgeous! Fabulous collection, so cool! THIS IS BEAUTIFUL! I can't wait to add it to my Simple Stories collection! There is nothing that I don't like about this collection! The color, patterns, embellishments, everything is just fantastic! Thanks for the chance! OMG....THIS IS MY FAVORITE so far!! The chip board elements YES PLEASE! perfect line for all of those family photos! Love the DIY collection. Looking forward to using it this year. Also love the Homespun collection. The colors are perfect.. I loved DIY and love Homespun as well....your collections just rock! Oh - just beautiful! LOVE the rustic and old fashioned feel to it!!! Awesome collection!! I love the colors and all the cute phrases!! Oh my I have to get this collection, those insta squares are so cute!! Lovely collection! I love how it coordinates to be a recipe book! So fun! I love this collection and want all of it! Perfect colors, and I just love the theme -- I can see an entire album with this and can't wait to get started. I love this collection because it Summer at it's best. Love this collection going to use it to put together a recipe album for my sisters bridal shower. Absolutely Amazing collection! I love, love, love it! ok - this is a MUST HAVE collection!! SWOONING!! Always impressed and inspired by Simple Stories! Thanks for the preview!! This is a gorgeous collection! I'm loving the recipe cards and snap album. What an amazing gift that would make! Beautiful new collection, I love the colours you chose for this one! I looove the idea of creative a recipe book! Definite must have collection for me. I can't wait!!!! I love this!!! What a wonderful new collection! I am looking forward to this one! Love this! The recipe cards are just what I need. I adore the family cards. Basically I just love it all. I love the colors in this series. LOVE the vintage feel of Homespun!!! I've been wanting to make a recipe book out of my sweet Gramma's old recipes and this is the collection to do it with! Can't wait! This is just absolutely AWESOMESAUCE!!!! LOVE IT ALL! I can't wait to get my hands on it. The stitching and homemade feel really make this collection irresistible! Thanks so much for sharing! I love this collection! Beautiful colors and sentiments. Gorgeous collection! That doily paper is so pretty and I'm loving the insta cards! the colors are very homey! Definitely LOVE everything about this collection! Can't wait to see it in person! Super cute collection, makes feel all warm & cozy! Awesome collection!! I love the recipe cards, I have a plain looking book that could use some spiffing up with these! Love it all! The new square cards are great and will be so useful! Love the family collection! I always have so may family photos so this would be great! Another collection to love! Those chipboard, all the papers & all those cuts!?! Love it all! I am so in love with this collection!!! I love the beautiful papers and the sentiment I am home when I'm with you on the journalling cards!!! Another absolutely wonderful collection! Love the colors and patterns, and especially all the added goodies to dress up the papers! Definitely want this one in my collection as well! Love how this works for any gender, time frame. Beautiful. another amazing line from Simple Stories! Love it all! another great line. It's fun to see you back in the industry! LOVE the colors and designs in this line. Right up my alley! SHUT UP! This is so amazing! I love, love, love it! Seriously...I just don't know how you all keep doing this...this being THIS! It's fabulous! I want!! I pinned the cookbook cover because it's representative of this whole wonderful collection. I LOVE it!! The bright colors, the cozy, homey feel. I love Snap books over all other smaller albums. I would be hard-pressed to really pick a favorite from this new collection! I'm in love with the whole collection, pinned it! Jlbrown316 is my user name. This is my fav!!!! just adore it all! oh my gosh - love it!! and go deanna, you rocked it! This is such a fun collection- the floral camera is darling!! I've been noodling with the idea of a recipe book, and I think you've just sealed the deal for me! Homespun can be used with so many themes! Oh just love love love this one !! GREAT work Simple Stories .. the reveal is absolute gorgeous .. ! This is perfect scrapbooking my family! Love this theme! Very pretty! I love the idea of creating a family recipe book! Very cozy and warm collection! I love the papers that go with this! The perfect homey and primitive feel! The recipe cards are awesome! Omg i can't wait till the coming days. I'm so excited!! I adore it all! Beautiful! So much I could do with this lovely collection! Pinning it to my CHA 2014 Favs! Beautiful papers and embellishments! I am sure I want these. You are killing my pocketbook! Thanks for the chance to win. Love all the colors. Fabulous collection. Pinned you to my CHA Wished board!! My username is Amy Grohs Vandiver. Hands down my FAVORITE COLLECTION from all of the sneak peeks (from all the manufacturers!) I absolutely will be buying this entire collection! !